Late 2013, Metropolitan Municipality commissioned the reconstruction of the garden “Doctors Memorial” of Society of CPA “Parkstroy Techno-TH” established by the partners “TH Consulting” Ltd. and “Techno-04” Ltd. The site is a garden of the central part, situated between the “Oborishte” Str., “San Stefano” Str., “Shipka” Str. and “Krakra” Str. The area of the garden has a total area of 20.63 acres, of which 4.2 acres are covered with flooring. Created by Antony Osipovich Tomishko and Luigi Farabosko about 1889. The beautiful garden around the doctoral monument was created around 1889 and is the first botanical garden in Bulgaria. The monument in the center of the park was built in 1884, dsigned by the Russian architect of Czech origin Antony Osipovich Tomishko and the Italian Luigi Farabosko. 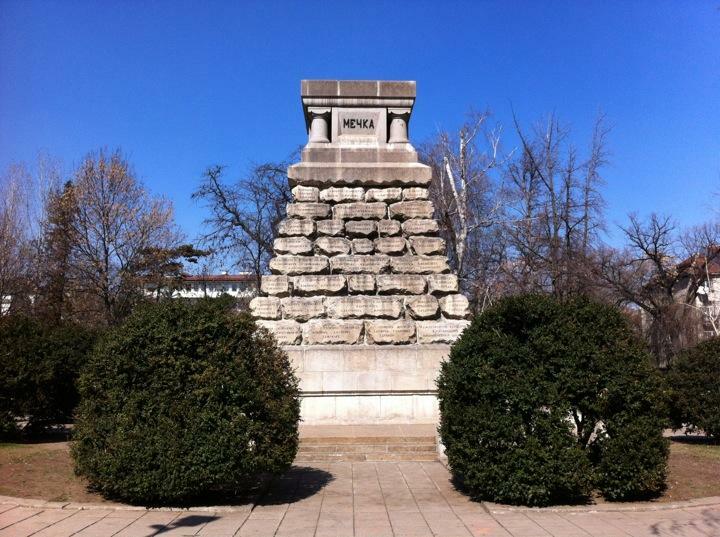 The four sides of the monument are covered with the names of the villages where the largest battles have been led. The west side is assigned to Pleven, east – to Plovdiv, north to Shipka and the south – to Bear Village. In 1889, at the insistence of the public, the area around the monument with the size of nearly 20 acres was designed as a garden. The first plan and construction of the garden are a work of the then municipal Swiss gardener Daniel Neff. The garden’s layout is characterized by circular shaping around the monument, which is the geometric center of the almost square plot, divided into four parts by two cross-shaped interesting main lines. In this miniature, the motif is repeated in four separate areas, receiving 16 small plots with landscape paths. Although it is schematic, this solution represents the first attempt in this country for a small garden to be planned and built in the spirit of the English-Chinese style. The old university botanical garden is converted back to public exploitation. Seven years after the creation of the garden at the request of Sofia University in Sofia, the garden was transformed into a university botanical garden. For 40 years Bulgarian botanists, foresters and landscapers have studied the great plant diversity. During the period between 1900 to 1934, head of the garden and creator of the rock garden, was the Bulgarian gardener Christo Mihov – the first Bulgarian to higher education in park arrangement in Paris. Under the management of G. Duchtev, in 1936 the garden again converted into a public space for a public use. This required reconstruction of vegetation and reconstruction of the line network with retention of the idea behind the original planning. During this process it was made a minor consolidation of space and simplifying the landscape lanes, so there can be seen picturesque views of diverse ornamental trees and shrubs, which now includes 13 conifers and 52 deciduous species, 30 species of shrubs, 20 species of perennials and many summer flowers. According to landscape specialists, there are the necessary preconditions that this site and its unique appearance, compositional completeness and richness of ornamental species should be cataloged as one of the first monuments of Landscape culture in Bulgaria. Playgrounds – Recovery of playgrounds for children 1-6 and 5-15 years – new layout, flooring and equipment of two children’s playgrounds, as required by the “Ordinance №1 /12.01.2009 terms and conditions for device safety of playgrounds”. The flooring of the playgrounds is safe, absorbs shocks and is fully eligible for BS EN 1177. In the northern part of the children’s playground, the area is 407.2 sq.m, and in the southern – 187.2 sq.m.